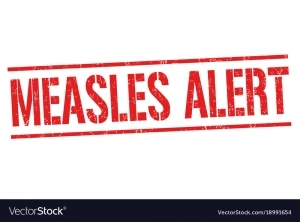 A measles alert has been issued after unvaccinated travellers caught the disease in Asia and then passed through the Gold Coast and several NSW towns. Gold Coast doesn't fare much better at 92.2 per cent - 2.5 per cent lower than the national average. "Anyone who develops symptoms should call ahead to their GP to ensure they're not in the waiting room with other patients," NSW Health official Greg Bell said in a statement. The measles-mumps-rubella vaccine is free for anyone born after 1965 who haven't had two doses.